How migrant activism in Italy (and beyond) is criminalised and used as a scapegoat for failed EU migration politics. Anti-racist demonstration after clashes between Casapound right-wing extremists who want a Red Cross-run refugee centre to be closed down and neighbourhood anti-fascists in Rome, Italy. September 16, 2017. Patrizia Cortellessa/ Press Association. All rights reserved.Since the EU-Turkey refugee deal, attention has shifted back to the North Africa-Italy route – and particularly the Libya-Italy Mediterranean route. This stretch of sea has for decades been among the deadliest for reaching Europe, and still is; the death rate among migrants attempting to cross the Mediterranean to enter Europe has long ago reached the body count of a war. Refugees are still dying at a quicker rate in the Mediterranean. Many still remember the tragedy that occurred on October 3, 2013 off the Lampedusa coasts, which cost the life of more than 350 men, women and children – mostly from Eritrea. Politicians paraded in front of the lined-up caskets in Lampedusa with the promise that they would take action to prevent such tragedies from happening again. The Italian government launched the Mare Nostrum humanitarian operation to ‘provide safety at sea’. But already in 2014, the rescue task was handed over to so-called Operation Triton, led by the Frontex EU agency. This was simply not adequate; several NGOs and international organisations duly had to take action with their own vessels and manpower, to supply more than 40 pct. of the total search and rescue operations at sea. On the initiative of the Italian government with the support of the EU, most of the NGO search and rescue operations in the Mediterranean have now been severely downsized. In fact, almost put on hold. NGOs operating in the Mediterranean have furthermore been accused on several sides of acting as a ‘taxi service to Europe’, thereby facilitating smugglers’ activities and their illicit business on Libyan shores. 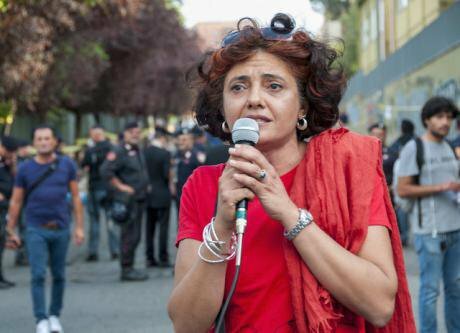 These measures can be interpreted as an attack against solidarity and as an acceleration of the measures that criminalize pro-migrant solidarity in Italy and the EU. In this regard, we argue that there is a very close relationship between: approval of the new immigration bill and the implementation of the so-called ‘Code of Conduct’ for NGOs doing rescue operations in the Mediterranean. At the same time, the frequent and often violent evictions of migrant squats, buildings and encampments we are witnessing taking place in major cities such as Rome, Milan, Bologna, and the rising number of trials against pro-migrant activists facing persecution for their activities, reveal a concerted attempt on the part of the authorities in Italy and Europe to undermine forms of solidarity with and for migrants in civil society. It is time that civil society resisted such attacks and actively reclaimed the role played by solidarity in our societies, if we still want to call them democratic. It is time that civil society resisted such attacks and actively reclaimed the role played by solidarity in our societies, if we still want to call them democratic. Italy’s new immigration bill and measures approved aim at: curbing migration flows, speeding up asylum evaluations, and restoring ‘legality and dignity’ to sub-urban areas. In reality, the common denominator is to criminalize migrants, pro-migrant groups, organisations and activists and integrate such an approach by means of regulations and the law. This entails the merging of criminal with migration law into ‘crimmigration’, to act as a better “gatekeeper of membership in our society”. The ‘crimmigration’ approach has developed out of ‘securitization approaches’, inaugurated in the aftermath of 9/11. It has contributed to the sponsorship of the migration control industry, based on the adoption of restrictive and security-oriented measures against migrants. Noteworthy examples include the increasing efforts to prevent migration by using punishment, policing and crime prevention methods, such as: detention, fingerprints, id-racial controls, walling, border patrolling, etc. These policy developments exact a very high price: the weakening of human rights, the rights of children and basic civil rights. Forms of criminalisation at the policy-making level today go hand in hand with the spreading of toxic narratives aimed at criminalizing refugees and pro-migrant solidarity. The recently implemented Italian law on immigration (Minniti-Orlando decree) and the Code of Conduct for NGOs – alongside other examples outside Italy, such as the Délit de Solidarité (Article L.622-1) in France and the Lander Geographical Restrictions (Asylum Procedure Act 2008, Article 56) in Germany epitomise what looks like an orchestrated attack against solidarity and against human rights. The Italian law on immigration (Minniti-Orlando decree)… – alongside the Délit de Solidarité in France and the Lander Geographical Restrictions in Germany epitomise what looks like an orchestrated attack against solidarity and human rights. Nowadays, a wide array of new infractions are directly itemised as criminal offences, and are addressed not only against migrants, but also against those individuals and groups “concealing, harbouring, shielding, aiding, abetting, employing, carrying and associating with criminal migrants”. All such measures legitimise and gather support for the joint criminalisation of immigrants and solidarity. As for measures a) and b): these will of course accelerate the process of asylum evaluations, but at the same time they will severely restrict and worsen their conditions, making procedures even more discretionary than they already are. These adjustments indicate an alarming convergence of criminal and migration laws in migration policy making. In particular, the removal of the possibility to appeal for denied asylum status breaches one of the fundamental rights in the Italian constitution (all are equal before the law), discriminating between Italian citizens and foreigners. The asylum seeker is in this way constructed as a distinct juridical person, and as such considered unentitled/undeserving to have access to the same rights as all others. Also, this manner of proceeding can only exponentially augment so-called administrative detention, given that deportation is an inhumane practice and in many cases impractical, both for political and economic reasons. So-called CIE (Centres for Identification and Expulsion) were first established at the end of the 1990s by the Turco-Napolitano migration law. This was later modified by the infamous 2002 Bossi-Fini Law and subsequently by the Security Act in 2012. All of these offer concrete examples of how incarceration was previously implemented in relation to forced repatriation/deportation. The duration of the detention should by law be limited to 30 days, which however often gets extended to up to 18 months, in the eventuality of “temporary circumstances obstructing the expulsion practice”. The ‘deportees’ are “deprived of their personal freedom, […] they are not allowed to receive external visits and thus it is not provided for them any kind of legal defence”. The introduction of the ‘clandestinity crime’ (art.10bis, T.U. Immigrazione) by the Bossi-Fini law also further restricted basic legal rights and guarantees: it virtually allowed police authorities to detain undocumented migrants, even in cases where these had not yet lodged an asylum application, or were without their working permit. Today, refugees are allowed to apply while in ‘detention’, but only to the police. An investigation carried out in 2013 by MEDU (Medici per i Diritti Umani, Doctors for Human Rights) showed that eleven out of thirteen operative Italian CIE at that time contained degrading and completely inadequate living and health conditions. Economically their management was inefficient and costly. In spite of reports clearly showing the malfunction and inhumane conditions of this system, the Italian government plans to increase the number of deportation centres. However, and in spite of reports clearly showing the malfunction and inhumane conditions of this system, the Italian government plans to increase the number of deportation centres, thus continuing to reinforce paradigms that associate immigration with crime, and crime with the need to lock people up. At the end of July 2017, the Italian Interior Minister discussed a new Code of Conduct for the NGOs doing search and rescue (SAR) operations in the Mediterranean Sea. The terms of the document had later to be signed by NGOs; Sea Watch, Jugend Rettet and MSF declined to do this, which implied they had to interrupt their SAR operations, followed few weeks later by MOAS. The code bans the entrance of the NGOs’ boats in Libyan waters, the trans-shipment of migrants on other vessels (except in an emergency situation, which requires coordination with the Italian Coast Guard) and the obligation to receive on board armed judicial police officers for investigations. According to the Italian government, these measures will curb migration flow into Europe via the Mediterranean route, and also prevent potential connections between NGOs and human traffickers, as blatantly stated by the public prosecutor of Trapani, Carmelo Zuccaro, a few weeks before the code was approved. Zuccaro’s declarations have ignited an aggressive furore directed at the role played by NGOs, with many politicians and media sources describing the NGOs as ‘the migrants’ private taxis to Europe’. The implementation of the Code coincided with renewed negotiations between the Italian government and Libyan authorities, particularly with the Tripoli government of Al Serraj. The meetings promoted by Minniti to establish patrolling zones along the migration routes and to strengthen Libyan Coast Guard activities have the clear aim of externalizing the Italian and European borders to Libya. Since the presence of NGOs and civil society representatives in Mediterranean waters would potentially interfere with if not obstruct these activities and agreements, the criminalization of migrant solidarity becomes an indispensable corollary of the plan. Similarly, attacks against migrant solidarity within Fortress Europe have increased in recent months. At the beginning of August, the Bologna based grassroots association Làbas, which also provides assistance and support to migrants in the city, was brutally evicted by police. Two weeks later, an empty building squatted in October 2013 nearby the Rome Termini station and hosting mostly Eritrean refugees was cleared by the police forces sent by the Rome municipality. Later, clashes broke out between police forces and the evicted, who had temporarily encamped themselves in the nearby Piazza Indipendenza. Several people were injured. Most of these people have not yet found a place to stay. Independence Square,August 24, 2017. 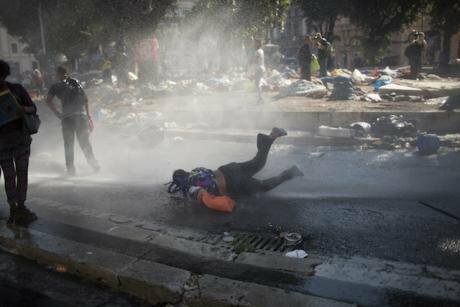 After hundreds were evicted, police use water cannon to 'disperse refugees'. NurPhoto/Press Association. All rights reserved.But these kinds of practices are not new to the recently installed municipal council led by M5S mayor Virginia Raggi who has declared that ‘no more migrants can move into the city’. Allegedly those already living in the city will now also be moved out. Prior to these recent events, the city council had shown scant regard for the activities, for example, of the pro-migrant grassroots’ organization Baobab, which since 2015 has provided shelter, support and first-aid to migrants. The Baobab group has been evicted eighteen times from different temporary locations including squatted empty buildings and open-air parking lots. Today the Baobab people have an informal address in a parking bay near a building that was evicted in 2001 and which has stayed empty ever since. These developments are part of a clear strategy aimed at criminalising and demoralising civil society mobilisation and pro-migrant solidarity and support. They go hand in hand with the dismantling of basic human rights and the portrayal of migrants as criminals. These are the next steps towards the creation of a migration policy based on policing, control and on authoritarian measures that demand structured and collectively coordinated transnational reactions from civil society at large, in Italy and across Europe.